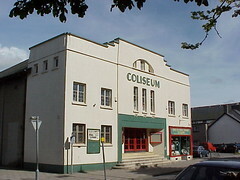 I wrote about the Coliseum Cinema, in Porthmadog, Wales in June 2008. It is a lovely little Art Deco cinema dating from 1931 and hosted sessions of the daily rushes of the TV series The Prisoner in the 1960s. In 1983, the cinema was faced with closure and locals united to keep this wonderful community asset open. Alas there are now new moves to close the Coliseum and, again, the local community is looking for support to help save it. Please visit the Save the Coliseum website to sign the online petition, make a donation or send a letter of support. It is a handsome building and quite different to our cinemas of the same period. I can see a similarity with some of Australia's rural cinemas like the Theatre Royal in Castlemaine. Fantastic looking building, I see from 'save the coliseum' website the local community were successful in 2012 in saving it for another year. Presumably another battle looming? Quite possibly. It would be nice if the community could secure the building for the longer term.